Fish are a popular pet choice because they require little hands-on care. After the aquarium is up and running, the home of your fish can be an incredibly relaxing place to watch. If you've ever wanted to start a fish aquarium, you'll find the tips here that will make the job easier. And when the time comes to clean the fish tank, there's a tip here that will teach you how to clean it with a vacuum. The following articles are available for the 'Fish' topic. Click the article''s title (shown in bold) to see the associated article. There is much more to aquarium lighting than simply hanging a light bulb over the tank. Make sure that you are giving your fish the best possible lighting that they need, and that you are doing it the right way. It's not as hard as you would think. 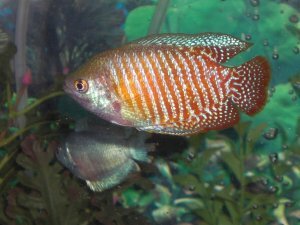 Taking care of your fish and keeping them healthy requires you to develop a habit of maintaining their aquarium properly. If you do not take care of the fish or tank properly, you will end up with very ill or dead fish. Cleaning the fish tank isn't always a fun job, and you may have wondered about the easiest way to do such chore. One thing you can try is to use a vacuum to clean up what shouldn't be there—simplify what you can! Most people recognize clown fish from the movie Finding Nemo, but there is much more to them than can be found in that wonderful movie. For starters, they come in more colors than simply orange and white. If you are thinking of getting one of these wonderful fish as a pet, make sure that you know a bit about them first. If you have an aquarium, then you know it is more than a simple home for your pet fish. An aquarium is also an investment and a means for protecting your fish and allowing them to grow as well as they can. However, for this to work you need to know the best ways of maintaining your aquarium. If you have some pet fish, one of the most important things that you can do is to learn how to take care of the aquarium. When done right, maintaining your aquarium doesn't take a whole lot of effort or time, but it does require dedication. Otherwise, you can find yourself needing to replace fish, or even the aquarium, a lot more often than you would like.